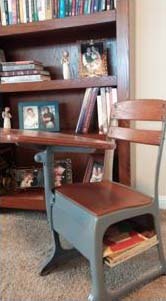 When our oldest son was a little boy, he’d often sit at this little desk and color. One day I noticed he had squeezed himself into the far corner and I asked him why he was sitting that way. He replied, “To make room for my friend. Hmmm. Roundcank? Well, I have to admit, that was a name I’d never heard before. And, being the astute mom I am, I quickly determined that Danny had an imaginary friend, so I played along. Of course he is. And of course Roundcank hung around for a very long time. He wasn’t at our house every day; I suppose like all good children he had to go home occasionally. But when he was at our house during mealtimes, we had to set a place for him right next to Danny. And when he went with us to run errands, we had to buckle him in. Safety first! A little while after Roundcank came to visit another friend showed up. Well, of course, if you’re an imaginary friend, it makes sense to keep your suitcase close. You never know when you just might have to disappear for a while, and you always want to be prepared! Heh-Heh-Harry liked to travel. He was always in the car with us. He bumped Roundcank out of the seatbelt often and I heard Danny scolding Heh-Heh-Harry more than once. It seemed Heh-Heh had a naughty streak and trouble just sort of followed him wherever he went. Where else would he go? You can’t just vanish into thin air; especially if you’re an imaginary friend, you must have a destination. Knowing this could be a potentially embarrassing topic I asked Dan if it was OK if I wrote about these two guys, he assured me he was fine with it but suggested I might want to check with Roundcank and Harry before I published the blog. Dear Roundcank and Heh-Heh-Harry, wherever you are, if you’re out there, if you’re real, I hope you are OK with this blog post. Would you please bless this blog and bring many readers and followers. And while you’re at it, would you bless all the people I love and keep them healthy. And please bring peace to everyone everywhere. Wait a minute – did I just pray to a couple of imaginary guys? Did you? Do you? For some people, this is pretty close to the reality of who Jesus is — sort of an imaginary friend. He showed up when we were young and he continues to come and go. He pops in at mealtime for prayer and he shows up with a bag full of verses when we are in need. However, as soon as everything is OK, he’s gone again. Will he come back? Who knows? Where did he go? To heaven? To church? For others Jesus is a bit more real, but he’s still not really a Person to hang out with all of the time; he’s more of an example to follow. As long as we do what we think Jesus would do, we’re doing just fine. If this is how you think about Jesus, the Bible has some wonderfully good news for you! First of all, Jesus is not a figment of your imagination, he is a very real person; the Gospels of Matthew and Luke list his physical genealogy. Not only is Jesus a real person, he is always fully God. Jesus lived a fully human, yet sinless life, and was therefore the perfect sacrifice for our salvation. We don’t have to hope, or pretend, that Jesus is real and alive because there are eyewitnesses to Jesus’ life, death and his resurrection. He is real, and he is alive today. Jesus doesn’t come and go, either; he is with you wherever you go and he will never leave you. However, this is true for you only if you believe in Jesus as he reveals himself in the Bible and you choose to receive Jesus into your heart. If the Jesus you believe in doesn’t fully align with Scripture, perhaps you are following an imaginary friend — an idea of Jesus that has been altered to accommodate the culture or someone else’s idea of who Jesus should be. Will you let go of an imaginary Jesus and embrace the One True God who is revealed in the Bible: the Jesus who died for you and lives so that you might live?